Click here to download a copy of the following article. What is your boat’s UPF? UPF is the “ultraviolet protection factor” indicating the amount of UV protection a product affords its user. It was developed in Australia/New Zealand in 1996. UPF is typically used to rate clothing and includes both UVB (Ultra Violet B) and the deep penetrating UVA (Ultraviolet A) in its evaluations while the more commonly known SPF (Sun Protection Factor) is typically limited to UVB because it is used in rating sunscreen lotions and their ability to prevent sun-burn which is caused by UVB. SPF notations are regulated by the FDA (US Food and Drug Administration) which just recently passed rules (which go into effect in 2012) stipulating products marked “broad spectrum” to include protection from UVA. Studies have long shown exposure to the sun’s UV rays dramatically increases the risk of cancer including melanoma and eye issues, including cataracts and macular degeneration. However, past thinking identified UVB as the major disease culprit and implied that UVA did not play as large a part. 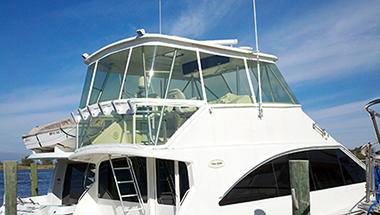 Because all enclosures block about 70 to 75% of UV, including virtually all UVB, it was believed the boater was well protected. Recent studies, however, show that UVA is a major player in pre-mature aging as well as the above disorders. Since UVA is the prevailing ultraviolet light in sheer volume and is present on cloudy days as well as sunny, it attacks the unsuspecting boater relentlessly. Add that to the fact that water reflects 100% of UV radiation and you realize why boaters should be acutely aware of the risk. As a comparison to the water reflection factor of 100%, snow reflects 85% while sand reflects only 25%. What’s more, but less known to the general public, is the adverse affect that UV can have on persons while taking certain medications needed for a wide variety of ailments. The list includes a number of antibiotics, antihistamines, cardiac drugs, diabetic drugs, diuretics, cancer chemothererapy drugs, painkillers, psychiatric drugs, etc. The list is quite extensive and the affects from just minor exposure (30 to 60 minutes) can range from allergic skin rashes, nausea and vomiting to confusion and fainting. One should check with ones doctor or pharmacist regarding this matter. Although skeptical of some science touted in-recent years, I am convinced of the importance of UV protection because of what I can see and easily prove. My boat stays in Maryland, the enclosure is four sided with a premium product and every other year I need to buy a new chart-book because mine, that sits on my console, crumbles to pieces. Sailors know the importance of UV protection! Try using a sail that has been exposed to the sun for any length of time and see how fast you experience a blow-out. Sail covers are a must, yet what is protecting our bodies from the same degradation? So, how do we protect our bodies? Use of sunscreen with the aforementioned “broad spectrum” notation can afford reasonable protection but application evenly is difficult at best and reapplication at regular intervals is mandated. Additionally, UV rated sunglasses are needed for eye protection, but if you remove them when it is cloudy, you get UVA penetration. Think clothing protects you? Some can, but you need to check the rating. A typical white Tee shirt can allow as much as 20% of the UV radiation to pass through. As mentioned earlier, existing enclosures offer protection from UVB but little or none from UVA. One common misconception is that tint provides protection; however tint does not establish UV protection and as a general rule does not afford it. In the case of eye issues, tint, without protection can make matters worse because it causes the iris to open up and thusly allows more harmful UV into the eye. Is there a practical alternative? Recently introduced enclosure materials utilizing technology originally developed to protect museum artifacts and documents can offer protection to the boater. These “next generation” enclosure acrylics filter out 98% of UV, provide distortion-free visibility and some even block almost 25% of the sun’s heat. These new materials are well suited for the Marine Environment and make protection both practical and comfortable for boat owners and their guests. For more information about products using these new materials contact Jeff Smith at jeff@cy4ez.com. The significance of the protection afforded is certain to have these products being utilized in other markets as well. Imagine a pool enclosure or awning that can give you the out-door experience while maintaining a virtual in-door level of defense from UV. and his efforts are attributable to countless enhancements in the marine enclosure market most take for granted today). Click here to view How Testing was Performed.